Pizza is a family tradition at our house. We’re particular about our toppings and crust, and harsh in our judgments about the not-quite-freshly-made pizzas sold at certain well-known chain restaurants. Even though none of us have so much as a drop of Italian blood in our veins, we’re all pretty sure we know the secret to making authentic Italian pizza the right way. Unfortunately, we each have a different opinion about which right way is more right. My husband, on the other hand, grew up eating a very different style of pizza from the kitchen of a little Italian grocery in his hometown. Thus our twenty-eight-year marriage has been one of pizza compromise as we searched for the perfect restaurant pizza and struggled to make our own perfect pizza despite the limitations of our home kitchen. 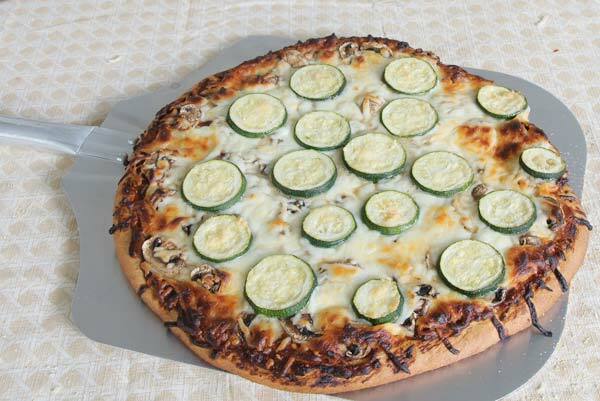 In time, each of our three children took after-school jobs in the kitchen of a pizza restaurant and learned the techniques for preparing yet another style of this family favorite. As adults, they’ve moved on to careers outside food service but pizza remains one of our bonding points whether we’re eating out or gathering in one of our kitchens to make it from scratch. The pizza we make now steals bits and pieces from many styles and sources. We’ve no single recipe. Instead, we’ve a collection of combinations that work for us. The base recipe for the dough is simple: flour, water, yeast, salt, and oil. The flours vary, and sometimes the oils, but the proportions remain consistent. We’ve learned that a certain texture works best with our pizza paddle and pizza stone, that if the dough’s too wet it will stick to the paddle and create a terrible mess. We nearly always use the pizza stone because we like the results. The exception is our deep dish iron skillet pizza, which some of us love and some don’t. The current seasonal favorite here at the farm is a whole wheat veggie pizza that showcases the last of this year’s zucchini crop. Preparation starts with the dough. These days I use a countertop Hobart mixer with a dough hook, but this recipe’s easy enough to mix and knead by hand. I start the dough about an hour ahead of time on warm days, two hours ahead if the weather’s cooler. This allows plenty of time for the dough to rise and the yeast and gluten to develop properly. Mixer instructions: Add all ingredients to the bowl and mix on low speed with dough hook until all ingredients are well-mixed. Let rest ten minutes, then knead with dough hook for 2-3 more minutes. Let rise until doubled. Punch down. Divide into two equal portions. Hand mixing instructions: Whisk together the first five ingredients, making sure the sugar and yeast are dissolved. Stir the salt into the whole wheat flour, then add the dry mixture to the wet mixture. Stir with a wooden spoon until the mixture is smooth. Add the remaining flour in 1/2 cup increments, mixing well until the dough is too thick to stir. Turn onto a well-floured surface and knead in the remaining flour. When dough is smooth, cover and let rise until doubled. Punch down. Divide into two equal portions. Finishing the dough: This dough works equally well for a pizza pan or cooking directly on a hot pizza stone. If using a pan, oil lightly and roll out the dough to fit. If using a pizza stone, be sure to preheat the oven to 450 degrees about 45 minutes before baking time so the stone has time to get hot enough. 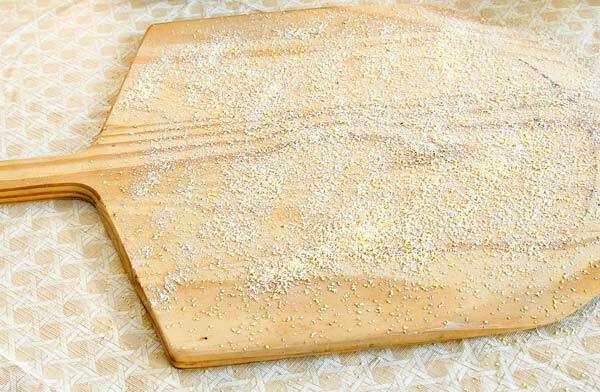 I use a wooden pizza peel covered with a generous sprinkling of coarse cornmeal when I build a pizza. First, the dough is rolled out into a round shape that’s no larger than the size of my pizza stone. Once it’s the right size, the dough is gently set in place over the cornmeal. 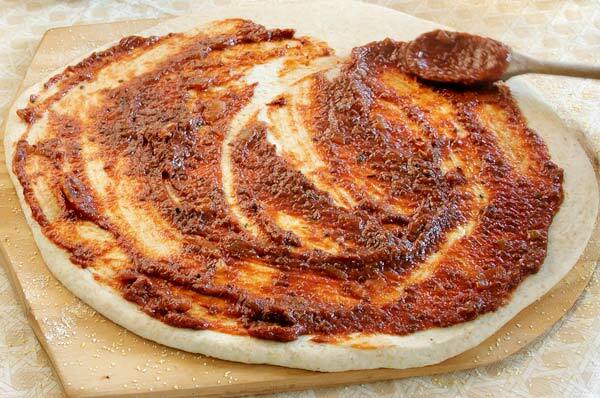 The cornmeal keeps the dough from sticking to the wood, and it allows the pizza to slide more easily onto the stone. You have to work quickly from this point on, though, or the moisture from the dough will soften the cornmeal. Once that happens, the dough sticks to the board anyway. 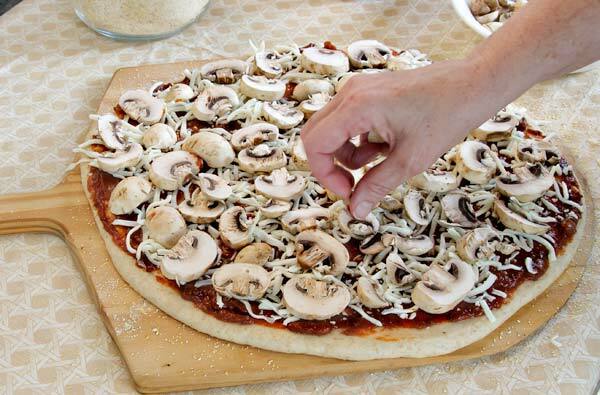 Spread the sauce evenly over the dough as thick or thin as you like. We like a generous amount of sauce and use quite a bit. Add about a half pound of shredded mozzarella . . .
and a layer of mushrooms . . .
more cheese . . .
. . . and finally, the sliced zucchini. You don’t have to layer in this order. 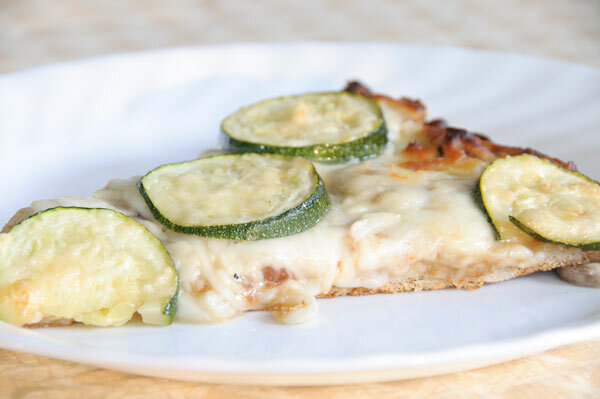 I do because I’ve found that the zucchini makes the pizza watery if it’s not on top where the extra moisture can evaporate. The same is true of the mushrooms if they’re under all the cheese. If they’re on top, they dry out more than I like. 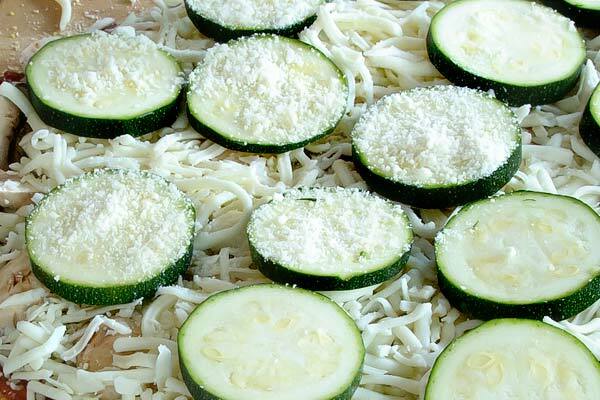 Finish by sprinkling the grated Parmesan over the zucchini slices. You can sprinkle it on the slices only, or over the entire pizza — the choice is yours. Bake 12-15 minutes at 450 degrees. 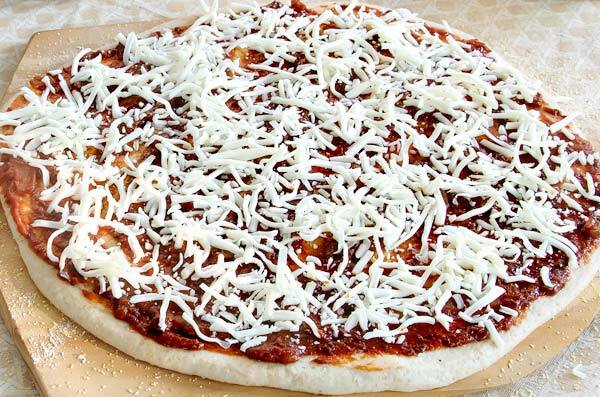 Remove when the bottom has browned nicely and the cheese on top is bubbling and beginning to brown. 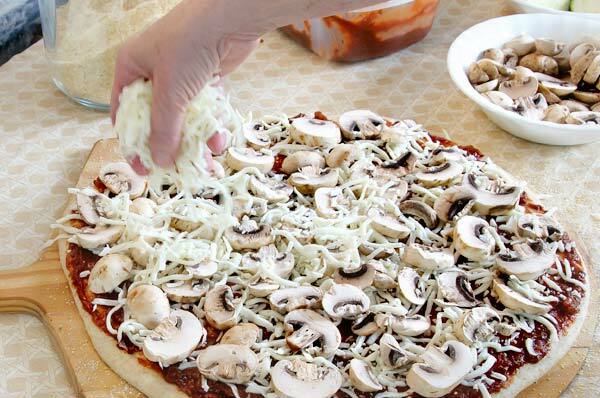 Let stand a minute or two to allow the cheese to firm up just a bit, then cut into slices. Otherwise it’ll stick to the cutting tool, string all over the place, and then the toppings will slide here, there and everywhere. Trust me, it just works better if you let your pizza breathe for a minute after it comes out of the oven. Recipe serves 16 nibblers or 4-8 normal pizza lovers. And yeah, I know I skipped the tricky part about how the pizza gets from the wooden peel onto the pizza stone, and back out of the oven. That’s another post for another day. PreviousGM salmon on your plate? 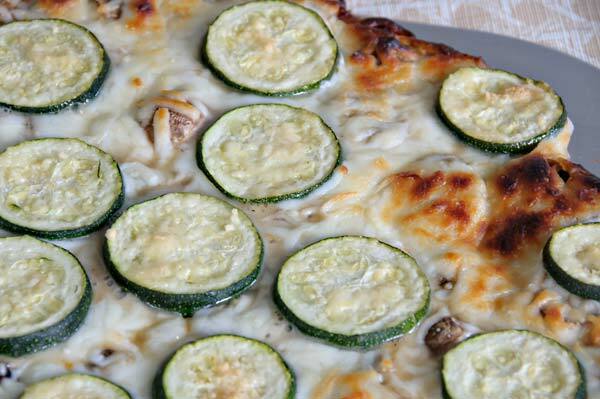 Zucchini is surprisingly good on a pizza. It’s still a bit crisp (not mushy) and has a slight sweetness from the ‘roasting’ in the oven. Of course adding parmesan to the top certainly helps. And my pizza style is still the best. Just saying. 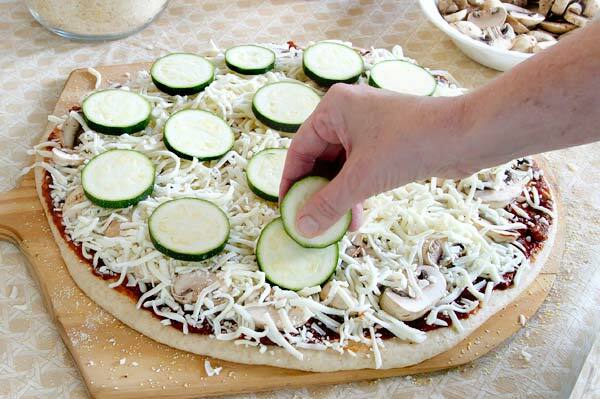 How do you keep a home made veggie pizza from being too soggy and moist? We also make home made pizza at least once a week. We use a large cast iron pan to cook ours in. just a little oil (I prefer olive oil) on the inside of the pan and then we cook them at 400* for about 15 minutes till the bottom is browned and the top is bubbly.. Yumm!